Cape Town – Taking the desperately one-sided, two-Test series into a fourth day at St George’s Park and seventh overall has got to be considered at least some kind of “result” by abject New Zealand. With the prior contest at Newlands seeing no further action after three days, the Port Elizabeth public, who have turned out in fairly encouraging numbers, have the bonus opportunity to watch the rampant South African team’s vultures gather one last time (unless there is a really sensational extension of the Black Caps’ mini-rearguard action) on Monday’s day four. It is probably fitting that when the tourists’ second innings resumes, the batsmen taking guard will be the two pluckiest of the series from their point of view, wicketkeeper BJ Watling and Dean Brownlie. The former has gone past the 40-mark three times in four knocks, whilst Brownlie resumes the massively improbable game-rescue bid with the still-fresh satisfaction of his maiden Test century in the steelier second innings at Newlands. But if their budding stand of 73 for the fifth wicket is broken pretty quickly on Monday, there must be a good chance that the rest of the line-up will once more succumb to a domino effect – it is not unreasonable for many local fans to suspect that the match and series may be settled by lunch. The new ball is only 13 overs away, so New Zealand, still a horribly distant 247 runs shy of staving off a second defeat by an innings on the trot, have a key first task of trying to get to it with no further setbacks. Their last remaining, supposedly specialist batsman in the “shed” is debutant Colin Munro, after all, and he will be sweating for more reasons than just the collective team plight – he is on a pair. Then it is the hitherto less-than-heroic New Zealand tail, in which Jeetan Patel, in particular, has become a subject of global bemusement for his apparent belief that getting into line means taking three steps toward the square leg umpire. I suggested before New Zealand had even started their first knock in Port Elizabeth that they might struggle to reach 220 in either innings, and they finished hugely short of that in the first instance; second time around there seems a better opportunity for my theory to be exploded, although I’m not warming up a humble pie yet. 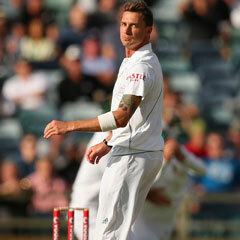 The snarling Dale Steyn and company, on a gradually deteriorating track with variable bounce, won’t be too upset about having an initial crack with a fading, roughed-up cherry, so the visitors really cannot expect much in the way of respite even during the first hour or so. New Zealand are ominously on course to join a several-strong club of international opponents who have reduced post-isolation series in South Africa to mismatches through either (or sometimes both) their inability or lack of real fight. Already installed are such teams as the West Indies of 1998/99, who brought shame to the once-mighty islands by being walloped 5-0, successive Bangladesh sides in 2002/03 and 2008/09, beaten 2-0 and by an innings every time, and also the Black Caps’ own class of 2007/08 – they were seen off 2-0 with a 358-run loss at the Wanderers and defeat by an innings and 59 runs at Centurion. Steyn was an absolute glutton in the wickets column in that series, grabbing 10 in each encounter, and overall currently boasts 46 Kiwi scalps at 16.15 in seven Tests against them on South African soil (the seventh obviously not even done and dusted yet). Meanwhile back in New Zealand, the heat only cranks up further on embattled coach Mike Hesson and captain Brendon McCullum. In Monday’s main daily the New Zealand Herald, columnist Chris Rattue writes: “Doing a u-turn. Eating humble pie ... call it what you like, and calling Mike Hesson. “Your mission, Mike, should you choose to accept it, involves returning Ross Taylor to the Test captaincy for the (looming) three-Test series here against England as New Zealand cricket tries to haul itself out of catastrophe. “On the subject of the national coach, has there ever been a bigger, single selection-type botch-up in New Zealand sport? “His blading of Taylor as captain rocked the boat on the eve of the toughest tour in world cricket, and a sinking ship has been sent plummeting to the bottom by South Africa.